Internal services are operated by Lufthansa (www.lufthansa.com) and Eurowings (www.eurowings.com) and several other airlines. Given the breadth and general efficiency of the public transport network however, internal flights should not be seen as essential. The Star Alliance Europe AirPass can be used for domestic flights within Germany, thanks to the fact that Lufthansa is one of its partners. Germany is covered by a busy network of motorways (Autobahnen). All roads, Autobahnen and otherwise, are toll free (other than for heavy trucks). Lorries are banned from travelling on Autobahnen on Sundays and on Bank Holidays throughout the year from midnight until 22:00 hours. Additionally, during the summer holidays in the months of July and August lorries aren't allowed on Autobahnen on Saturdays from 0700-2000 hours, making it easier for cars to cover long distances. Autobahnen are three- or four-lane motorways, while Bundesstraßen signifies secondary B routes, federal highways. Landstraßen (also known as Staatsstraßen) are state roads. Self-drive cars are available at most towns, airports, and major railway stations – a high number of international car hire companies are present in Germany. Almost all German taxis are cream-coloured Mercedes with yellow-and-black signs on their roofs. You're far more likely to find a vehicle at a taxi stand than flag one down. Fares are metered. Germany holds real appeal for cyclists. Designated bike paths are commonplace and long-distance routes are widespread. If you're serious about cycle touring however, be aware that the country is a very large one. Bike hire is easily available. Several leading cities, including Berlin, Frankfurt, Munich and Stuttgart, have a 24-hour interactive bike-hire scheme which tourists can sign up to (www.callabike-interaktiv.de). Though by no means as time-efficient or lauded as the rail service, Germany’s extensive bus network still offers a workable (and reasonably comprehensive) way of exploring some of the country’s more remote regions. Local services are run by regional companies, and many timetables stop at the weekends. 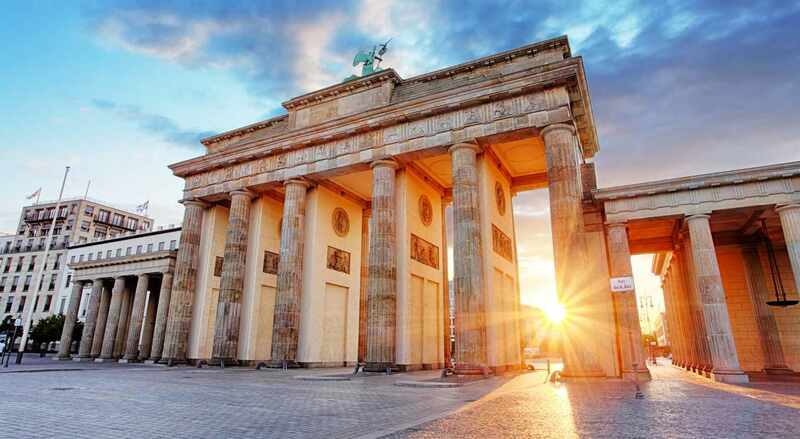 Eurolines (www.eurolines.com) offers routes from the UK to the larger cities in Germany. Traffic signs are international. Speed limits in Germany are 50kph (31mph) in built-up areas and 100kph (62mph) on all roads outside built-up areas. Unless otherwise indicated, there is theoretically no maximum speed limit on Autobahns, but 130kph (81mph) is recommended. The minimum driving age is 18. Winter tyres are a legal requirement during periods of snowfall and in case of slippery ice. The Allgemeiner Deutscher Automobil Club (ADAC) (emergency tel: 0180 222 2222, in Germany only; www.adac.de) is the principal national assistance network. Insurance is mandatory, and you should also have a full driving licence to hand. All urban areas have efficient bus services, complemented in a number of larger cities by trams, and underground or suburban trains. In most larger cities, tickets for a local transport journey have to be purchased from ticket machines before boarding the suburban train (S-Bahn), underground (U-Bahn), bus or tram. Ticket inspections are frequent, with on-the-spot fines issued. Taxis are widely available in the main cities, and operate from designated ranks. They can be advance booked by telephone. Berlin: The city's excellent public transport includes an extensive network of buses, underground and S-Bahn in three travel zones. In the eastern part of the city, tram services and the ferries of the Berliner Verkehrs-Betriebe, BVG or Berlin Public Transport (www.bvg.de), in conjunction with east Berlin's White Fleet (Weisse Flotte), provide further services. Day and longer period passes are available covering all services. Taxis are generally available throughout the city (www.quality-taxi.de). Frankfurt: An extensive tram network and bus services serve the Rhine-Main region, operated under the auspices of the Rhein-Main Verkehrsverbund (tel: +49 69 2424 8024; www.rmv.de). As in Berlin, 24-hour passes for all types of public transport are available, as is a large fleet of cream-coloured taxis. The central taxi booking number is +49 69 230 001. Munich: The Bavarian capital has some trams, plus comprehensive bus, underground and suburban rail services. Services are operated under the aegis of the Münchner Verkehrs-und Tarifverbund (tel: +49 89 4142 4344; www.mvv-muenchen.de). Again, taxis are widely available. Taxis can be booked on +49 89 21610. Note: Pedestrians should be aware that it is technically an offence to cross a road when the pedestrian crossing lights are red, even if there is no traffic on the road. Offenders can risk on-the-spot fines – in practice, this is unlikely to happen. Adults should set a good example for children not to cross the street when the lights are red. The national rail company Deutsche Bahn (www.bahn.de) operates tens of thousands of passenger trains each day. The most famous of these are the Intercity-Express (ICE) services, which reach speeds of up to 300kph (186mph) and run between major cities, both within Germany and internationally. A number of less speedy (but still efficient) inter-city and international trains also run. A range of Bahncards is available from Deutsche Bahn, offering a number of different discount schemes for travel within Germany, and varying advance purchase discount options are also offered. For visitors not intending to be in the country for months on end, the two most relevant options are the BahnCard 25 (providing 25% discounts) and the BahnCard50 (providing 50% discounts). With an InterRail One Country Pass you can choose from unlimited travel on three, four, five, six or eight days of your choice during the course of a month. Regular scheduled boat services operate on most rivers, lakes and coastal waters. Besides scheduled services, special excursions are also available on many navigable waters. The KD German Rhine Line (tel: +49 221 208 8318; www.k-d.com/de/) covers the Rhine and Moselle rivers, and has comfortable ships that operate daily from April to late October. In conjunction with the Sächsische Dampfschiffahrt, the KD also organises cabin cruises on the Elbe between Meissen and the Swiss border, via Dresden. Lake Constance is served by regular steamers, pleasure boats and car ferries between the German, Swiss and Austrian shores. The Lake Constance Adventure Passes (Bodensee-Erlebniskarte) (www.bodensee.eu/de/darum-buchen) give free travel on many vessels in the Lake Constance area, as well as discounted admission to attractions. The pass is valid for three days.